Bridge assurance comes up often in Nexus troubleshooting. Therefore it is important to understand its design and effect. What is BA? It is a Cisco STP enhancement feature designed to prevent loops, by making sure that a neighboring switch does not malfunction and begin forwarding frames when it shouldn't. Configured incorrectly, BA will likely cause some headaches. BA monitors receipt of BPDUs on point-to-point links. When the BPDUs stop being received, the port is put into blocking state (actually a port inconsistent state, which stops forwarding). This is typically seen with "show spanning-tree ..."
1. If STP "network" type is used with a host VPC, the host side does not support bridge assurance, and we know Nexus 1000v does not even send BPDU, then turning on BA on Nexus 5000 will make the port go into “inconsistency” and blocking. 2. With Nexus 7000 and 5000 back to back VPC connections, it is important to set both sides to type “network”, thus enabling BA consistently. Otherwise, it will also go into blocking state due to inconsistency. See a more complete picture of spanning tree design is a typical Nexus virtualized data center here. In part 1 of the post, we solved feedback on OSPF side, but issue in the opposite direction still exists. OSPF routes redistributed into EIGRP on R1, R2 learns from R1/EIGRP and prefers it (since we have lowered EIGRP EXT AD to fix issue 1). 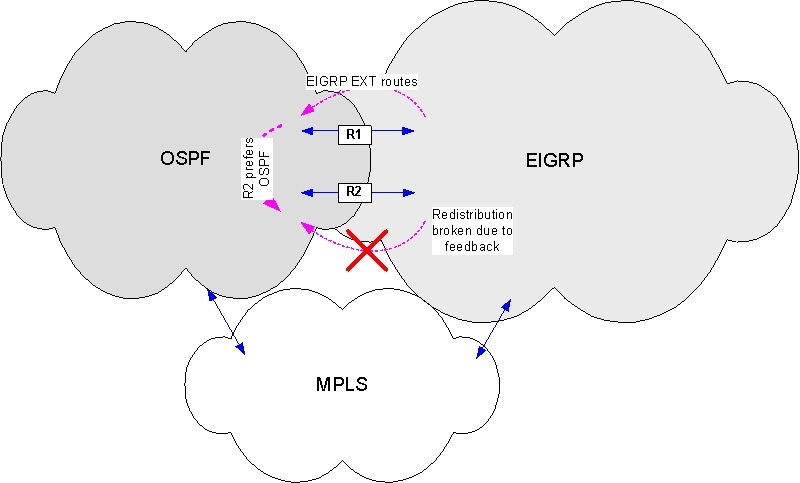 Because R2 now prefers the feedback route, it will not redistribute these OSPF routes to EIGRP. First, between R1 and R2, stop EIGRP advertising routes redistributed from OSPF. As best practice, also use tag to stop the feedback to redistribution points, by blocking OSPF originated routes from redistributing back into OSPF. What about routes learned from MPLS? Those are typically remote offices, which we don’t want to be redistributed from OSPF. See an MPLS remote network 10.103.2.0/24. EIGRP side gets it from BGP as EIGRP EXT. OSPF side also gets it from BGP. Could redistributing router prefer EIGRP (since we set lower AD)? The router has two paths (left and right) to go out to the WAN to reach the remote site. 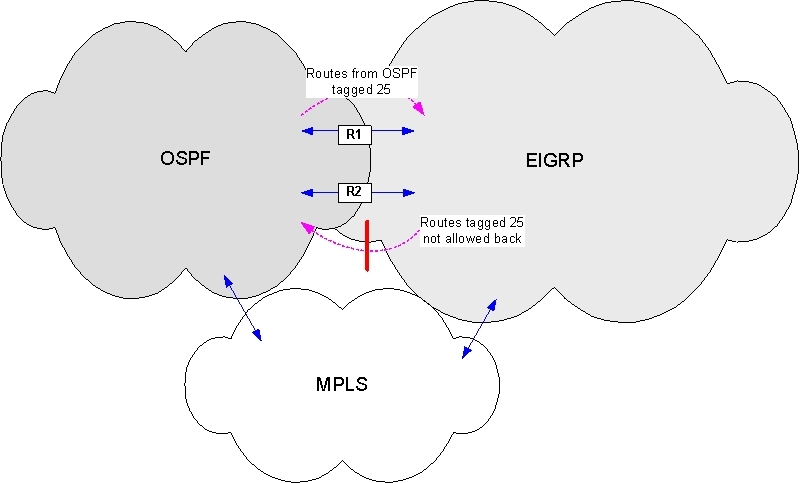 We would want it to use the “local” MPLS exit point, in this case is through OSPF. This is where EIGRP metric becomes important. Note EIGRP must have at least default metric for redistribution to happen. It is learning the same route from both BGP and OSPF. At the point of redistribution, the metric assigned to routes redistributed from OSPF to EIGRP should be lower than EIGRP metric going the other way (typically by setting lower bandwidth on WAN links). As a result, the redistribution router prefers the locally redistributed routes from OSPF. But MPLS does cause additional feedback issue, which we will cover in part 3. In our data center, enabling jumbo MTU has proven to result in significant throughput improvements. It should have been straightforward, but unfortunately not with Nexus. This note is meant to fill in a gap where existing documentation may be lacking. In a typical Nexus 7000/5000/1000v architecture, use these steps to enable jumbo MTU end to end, and then verify. It defines the maximum MTU size for the switch, which must be configured on ALL devices. Note the max value depend on hardware, for example it’s 9000 on Nexus 1000v, and 9216 elsewhere. Note it can not be configured on the interface! This is quite different from any other device I am aware of. To make it even more confusing, the command varies between releases. You will see some documentation showing configuration on physical interface, and disappointed when you actually try to do it. No, it won’t take the command. You must configure on the port channel! And then, magic, it will appear on the physical interface. More detailed explanation on Nexus1000v is here. CSCsl21529, Symptom: An incorrect MTU value is displayed in the show interface command output. The Cisco Nexus 5000 Series switch only supports class-based MTU. Per-interface level MTU configuration is not supported. The switch supports jumbo frames by default. However, the show interface command output currently displays an incorrect MTU value of 1500 bytes. Also, VEM may not retain jumbo MTU setting after reboot. Just something to watch and monitor. It is still a common design to use IGP in the enterprise core. For a large enterprise, the requirement to integrate OSPF with EIGRP may be the result of mergers and acquisitions. As I worked through the issues in a very large enterprise environment, We have seen multiple issues having a chain reaction, making the symptoms very difficult to diagnose. Sometimes, fixing one issue may introduce new ones. Unless we have an absolute crisp grasp of the design, and a systematic approach, the chance of confusion is extremely high. This is the first of a 3 part series which I thought would be worthwhile to share some basics, and provide a logical breakdown of the interacting issues into separate and manageable pieces. The much simplified diagram shows dual mutual redistribution points (blue arrow). So what is the issue? with dual router mutual redistribution, feedback can occur in both directions, resulting in inconsistency on the two redistribution points, and sub-optimal routing, even potential routing loops. Only applies to EIGRP EXT routes, which has a higher AD (170) than OSPF (110). These routes are redistributed into OSPF via R1. R2 learns from R1/OSPF, and prefers it. 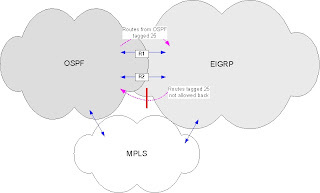 Therefore R2 will not redistribute these routes from EIGRP to OSPF, resulting in only one path used. 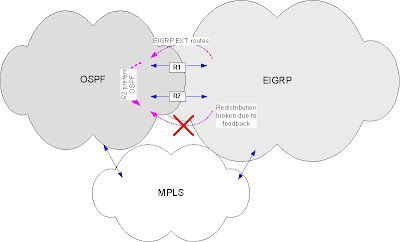 Any EIGRP EXT route that doesn’t exist in OSPF will show up on one of the routers as preferring OSPF due to lower admin distance, breaking EIGRP->OSPF redistribution on one router. This means all traffic will be directed to one side. This issues is resolved by setting EIGRP EXT AD to lower than OSPF (distance eigrp 90 100). Note there is a side effect, the redistribution router will always prefer EIGRP path (due to lower EIGRP AD). But within OSPF, routes redistributed from EIGRP will have a higher metric (set with redistribution route map), therefore there is no risk of disturbing preference within OSPF. Setting OSPF EXT AD(distance ospf ext 200) is similar. Both solutions will introduce issue 2, which we will cover in part 2.